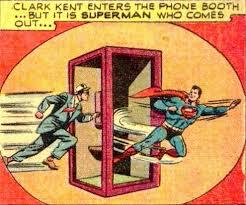 At one point in history, the transition from Clark Kent into Superman was done in a phone booth. The changing room for the “man of steel” was a utility of the every man. People could feel their own association to this man with supernatural powers by simply making a phone call. Unfortunately times have changed. The phone booths have disappeared and so have our beliefs in the possibility of greatness for the common man. In the modern day, the only small changing room available to Superman would be a Port-o-Potty. As depressing as this may seem, perhaps it is the perfect mental picture for the situation of the day. Our inclination is no longer to believe in the magnificent or the awe-inspiring. Instead we assume that everything is a sham, fraud or ripoff. Our hope has been sullied by too many people that sought to capture our dollars and not our hearts. A hero of today almost has to rise out of the refuse because we tend to assume that squeaky clean is too good to be true. Or worse, we cannot believe in our own possibility for greatness because we know where we come from. Clark Kent, the phone booth or the port-o-potty are all just a prelude to the magnificent. In our cynical world, it’s easy to poke holes in anything and find what is wrong. The measure of the hero is not in his lack of faults. The hero is measured by how consistently he shows up and does what other people cannot or will not. So do not assume because your story is not perfect that it is not your time to be the hero. At bare minimum there is at least one person in this world that needs you to show up every day and do whatever you’re able. That person is you! You’re the hero that you’ve been waiting for!